Give the Gift of Iowa Gardening! The perfect gift for a new gardener, someone just moving to Iowa, or a long-time gardener who always likes new tips and tricks. The book is broken down, month-by-month, with helpful articles on everything from starting seeds indoors in early spring to the best methods of composting in late autumn. Gardening in Iowa is like gardening no place else. We are blessed with rich soil and ample rainfall that can make gardening a joy. But gardening in Iowa also can be a challenge with a highly variable climate that can change not only year to year by hour by hour. And Iowa winters are legend. "Gardening in Iowa" is a month-by-month guide that helps gardeners of all experience levels and geographic origin have a better, easier, more satisfying gardening experience. Beginning in January, the book presents a monthly checklist to allow gardeners to prioritize seasonal tasks. Winter chapters focus on garden design, cold-weather gardening, and starting plants from seeds. In spring they move into soil preparation, shopping for plants, wildflower and rose cultivation, and lawn care basics. Summer brings landscaping, flowers for cutting, and organic gardening; and fall involves cold frames, winter-harvest vegetables, and forcing bulbs. 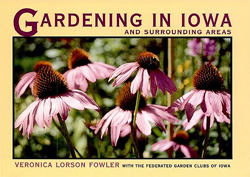 The book also contains listings of the perennials, trees and shrubs, and ground covers and vines best suited for Iowa's climate as well as information on mail-order suppliers, gardens to visit, where to go for help, and garden club memberships. Tips from some of the more than 2,000 members of the Federated Garden Clubs of Iowa round out this plentiful harvest of useful advice. 1. Call 515-343-9670 from 8 a.m. to 6 p.m. Central Time on weekdays. Or you can email us at info@theiowagardener.com with your phone number and we will return your phone call as promptly as possible. Please DO NOT email the payment information. 2. We'll take your credit card and contact information over the phone. Please let us know if you would like an inscription (free) or gift wrapping ($8). 3. To assure delivery by Christmas 2015, we recommend placing your order by December 14th. 1. Send a check for $26.50 to cover the book and shipping to The Iowa Gardener, Book Orders, 1031 Ridgewood Ave., Ames, Iowa 50010. 2. IMPORTANT: Please enclose a note or otherwise signify where you would like the book shipped to. We can ship directly to a gift recipient. 3. IMPORTANT: Please include a phone number and email where we can reach you with any questions. To assure delivery by Christmas 2015, we recommend mailing your order by December 11th. 4. If you would like an inscription, please write it on an enclosed piece of paper. With all orders, we can process them within 2-4 days. We ship priority mail so the package will arrive 2 to 3 days after shipping anywhere in the continental U.S. Gift wrapping is available for an additional $8. Sorry! Delivery in continental U.S. only. FedEx options available for orders of 10 or more. If you have questions or concerns call Ben at 515-343-9670 from 8 a.m. to 6 p.m. Central Time on weekdays or email us at info@theiowagardener.com.